Sometimes you get that craving for a comfort food meal of pasta. Pasta anything! And zoodles just won’t cut it! So how can you have your pasta and keep to your healthy eating journey? Thankfully, in the market today there are options in the pasta aisle for almost any need. Here are some tips on how to pick the best one for you, a review of three I tried and a Ceasar Kale Pasta Salad Recipe! First tip is to read the ingredients list. Look for things that you are trying to avoid. The pasta may be packed with protein, but it may also has whole wheat flour. If you are wanting protein and gluten-free, this would not be the best choice for you. Second tip goes along with the first. As you peruse the ingredients, look for a brand who uses simple and few ingredients. And ones that you know what they are and can pronounce! Xanthium gum and tapioca are included in some pastas to help them stay in their shape and add texture, so even though you may not have experienced these ingredients before, they are widely used in gluten-free products. Finally, don’t overcook your noodles. Especially the gluten-free ones. Follow your pasta instructions and check the noodles by tasting them to be sure they are tender but still firm. Here are the three pastas I am reviewing for you! Modern Table Lentil Rotini had a simple ingredients list, plant-based protein and gluten-free. Cooked well, like a normal pasta in 8 minutes. Con? It has a little bitter after taste and the pasta was a little chewy. I think the taste comes from the plant-based protein. I would give it 3.5 stars out of 5. Next the Barilla Protein Plus Angel Hair is a regular pasta that is infused with 17 grams of protein (the lowest amount of all the ones I tried.) It cooked in about 6 minutes, has a more complicated ingredients list with wheat, eggs and some unidentified pea protein. However, it looks and tastes like regular pasta, very tasty. Add some veggies to up the fiber with this one. It’s a direct swap for regular pasta, but infused with protein. Four stars of 5. Finally, a gluten-free chickpea-based Banza Cavatappi pasta. It has 25 grams of plant-based protein and a good amount of fiber. It has a simple ingredient list and vegan friendly. When cooking, it has quite a lot of foam and will boil over quickly if you don’t watch it closely! Be sure to rinse this pasta after cooking and before eating. Great as a main dish pasta. They had many different styles. There isn’t the bitterness of the Lentil pasta, but the texture was just a little chewy on its own. I would give it 4.5 stars out of 5. Bottom line is to know what goals you are working to meet and look for a pasta that will help you achieve them! Below is a recipe for a kale Caesar pasta salad you can use with any of these pastas!! Enjoy!! Heat oven to 400 degrees. Place tomatoes, garlic, oregano, kale and olive oil on a large sheet tray. Roast for 10-12 minutes until tomato skins burst. Cook pasta according to package directions and place in a large bowl. Add roasted tomato mixture, dressing and cheese to bowl with pasta. Toss and refrigerate for 30 minutes before eating. Winter always seems to be a bit of a hard time to eat salads. I don't know whether it's the cold temps or the grey skies, but I struggle to eat salads in the winter! I always end up ditching my salad for a hot bowl of soup or a heavy sandwich. However, after a week of vacation where I basically turned into a human vacuum, I was actually craving veggies and salad! So I whipped up this easy, hearty winter salad. I enjoyed eating this salad so much that I meal prepped it for two weeks in a row! The wintery squash paired with the filling quinoa tricked my tastebuds into thinking I was not eating a salad. The cranberries and apple add a sweet zing and the walnuts add a slightly bitter taste that prevents the sweet notes from overpowering the salad. I didn't go crazy with the dressing, just a simple drizzle of aged balsamic vinegar does the trick! Heat oven to 400 degrees. In a small pot on your stove, add quinoa, water and 1 teaspoon olive oil. Bring to a boil. Cover and simmer until water is absorbed by the quinoa (about 10 min). Remove from heat and set aside. Place spiralized butternut squash on an ungreased baking sheet and drizzle with olive oil. Roast for 10 minutes until noodles are soft. Set aside. In four plastic prep containers or plates, evenly divide kale/arugula mix. 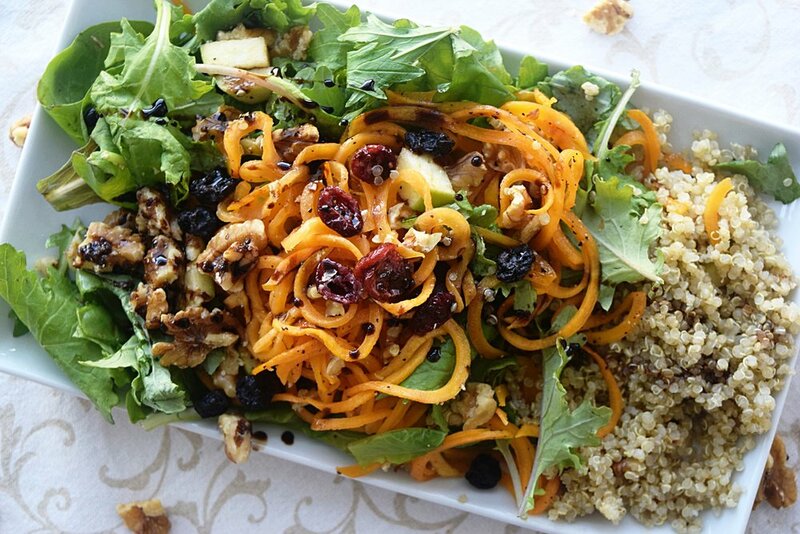 Top with cooked quinoa, roasted butternut squash, apple, cranberries, nuts and finish with a drizzle of vinegar. Easily saves for 3-4 days in the fridge. I use this salad as a side dish. It's got a strong flavor so a little goes a long way! 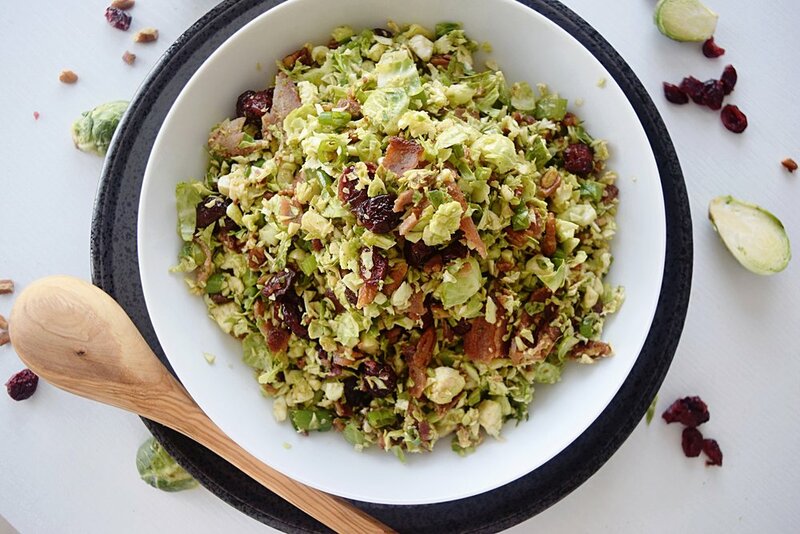 To make sure your Brussels sprouts are perfectly chopped, cut off the bottom stem, discard the stem and throw the sprouts into a food processor. A few seconds later and bam! You have a perfectly chopped base for the salad. Another tip is to make sure you don't burn the pecans. Cook them in a skillet just until you smell warm spices and nuts then remove from the heat. Burnt pecans are extremely bitter! As a variation on this recipe, you could also slice the Brussels sprouts in half and roast them. Then toss with the other ingredients! For the pecans: In a small skillet, add oil, pecans and spices. Heat over medium-low heat until you smell warm spices and pecans are coated with the spices. Remove from heat and set aside. For the salad: Chop the stem end off of the Brussels sprouts and discard the stems. Place Brussels sprouts in a food processor. Pulse until they are broken down into tiny pieces. 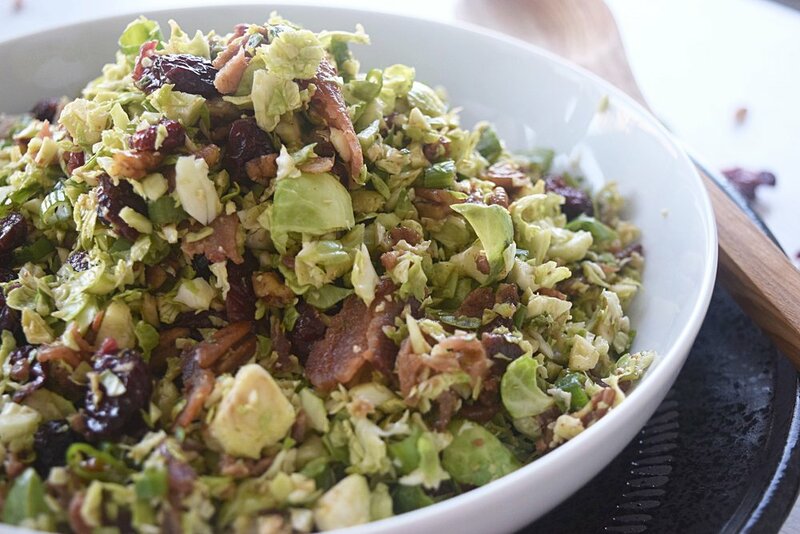 Place processed Brussels sprouts, cranberries, pecans, bacon, and onion in a large bowl. For the dressing: Add all of the dressing ingredients to a small bowl. Whisk until a smooth thick dressing forms. To assemble: Add dressing to bowl with salad ingredients. Toss to combine and serve. Store any leftovers in the fridge for up to 3 days!